First, melt yellow candy melts (see melting chocolate above). 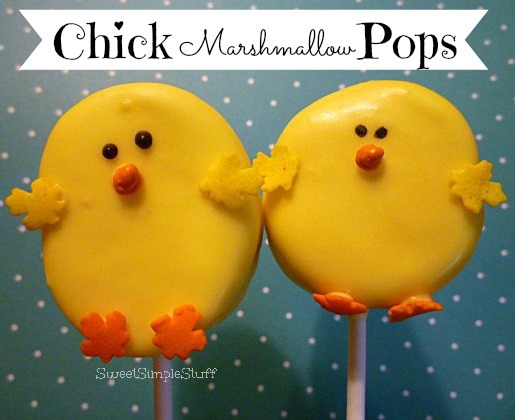 Look at your marshmallow and decide what surface is the front of the chick … insert lollipop stick all the way into the marshmallow. 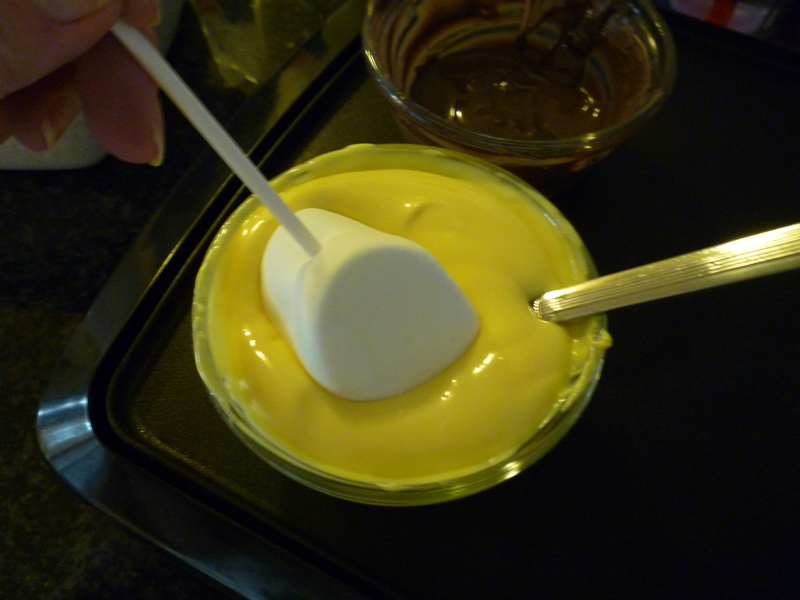 Dip it into the melted candy covering the entire marshmallow and just touching the stick. Tap the sucker stick to shake off excess candy. 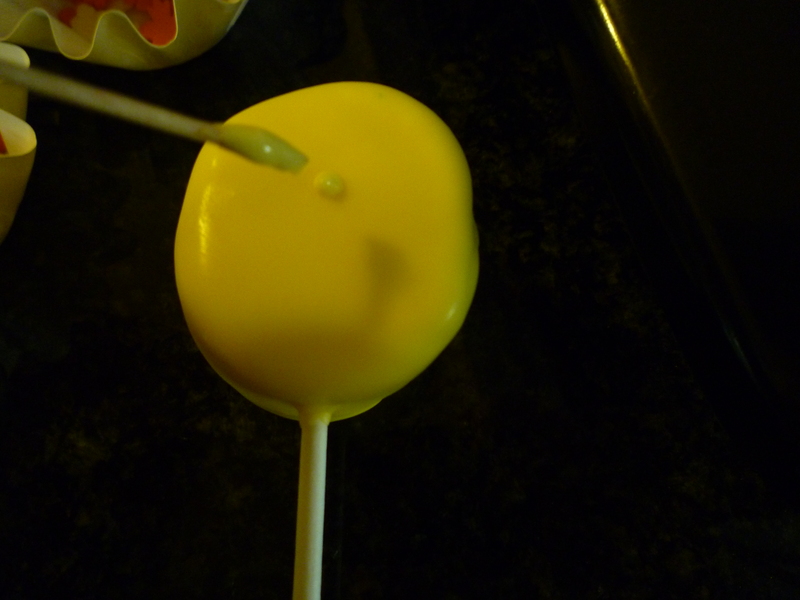 If you get too much candy on the stick, clean it up now or wait until the candy has hardened and trim with a paring knife. 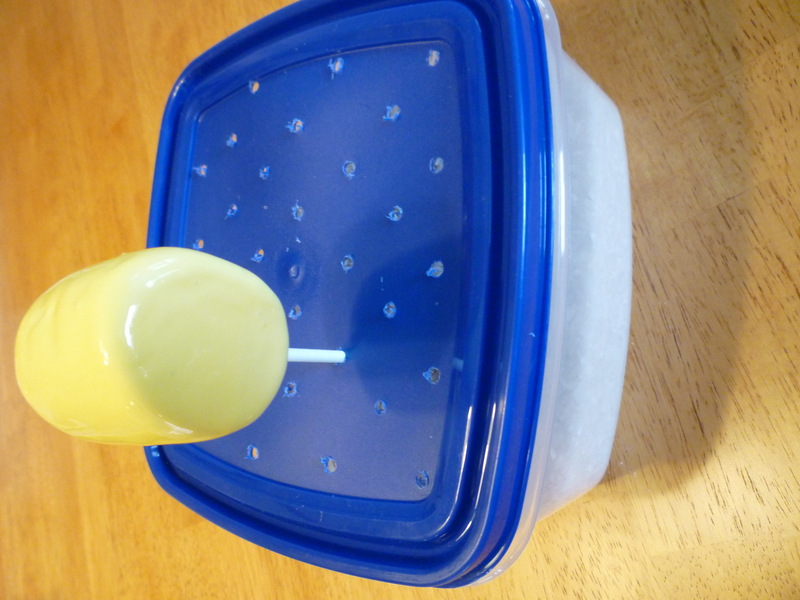 I just made a sucker stand with an inexpensive (dollar store) plastic container, filled with rice or beans and drilled holes in the lid. Before I made my fancy dancy sucker stand, I would lay the candy dipped marshmallow in a piece of wax paper, parchment paper or stand it up in a piece of styrofoam. Warning … if you lay the sucker down, a puddle of candy may form … but don’t worry, it can be trimmed up with a paring knife after the candy has hardened up. Pop the marshmallows in the fridge or freezer for a few minutes to harden up. 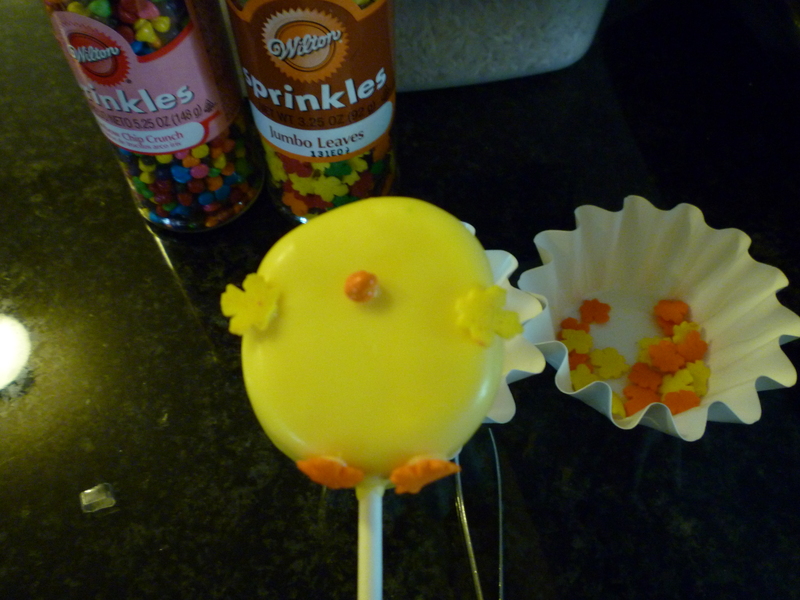 We will now add personality to the chick … using a dot of melted chocolate as “glue”, attach a beak, wings and feet. I used an orange Wilton Rainbow Chip for the beak and Wilton Jumbo Leaves for the wings & feet. 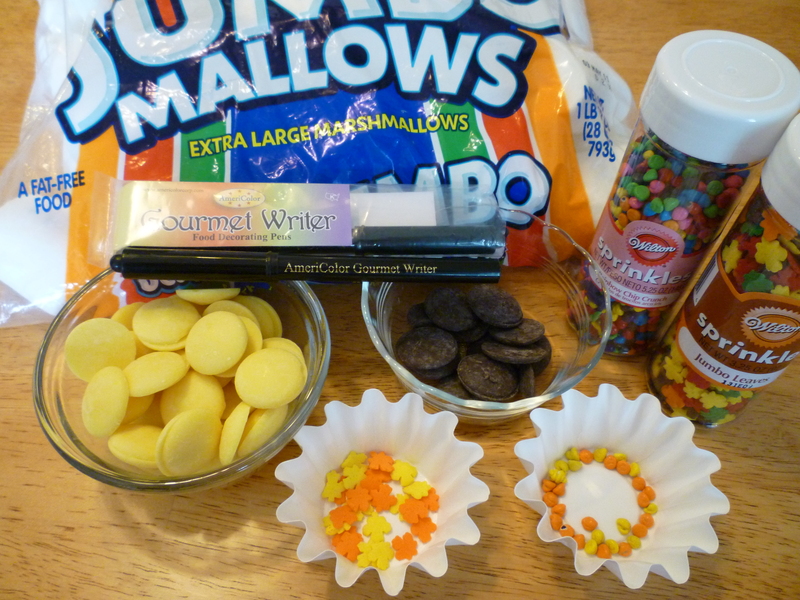 If you can’t find these items … Starburst candy can be flattened and molded like clay … there are so many colorful candies available. This poor little chick wants to see … please give him eyeballs! 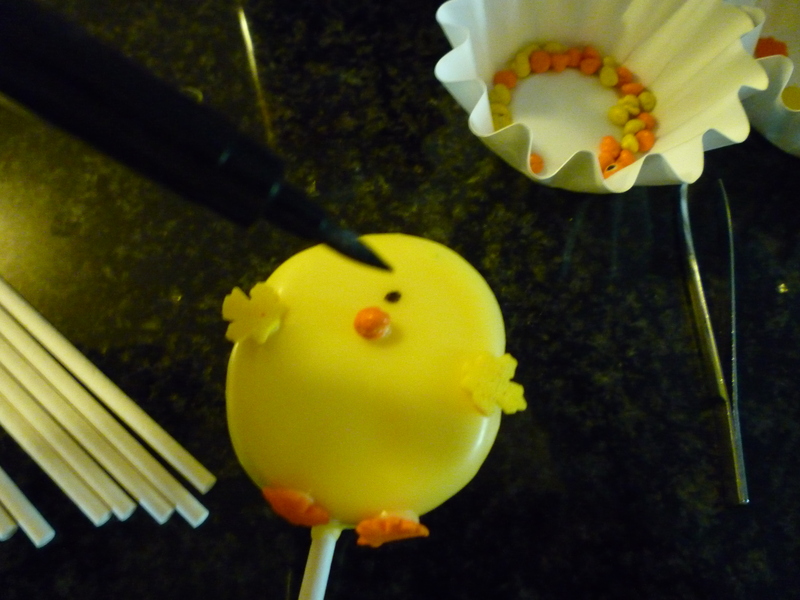 Use melted chocolate with a toothpick or draw eyes with an edible marker. 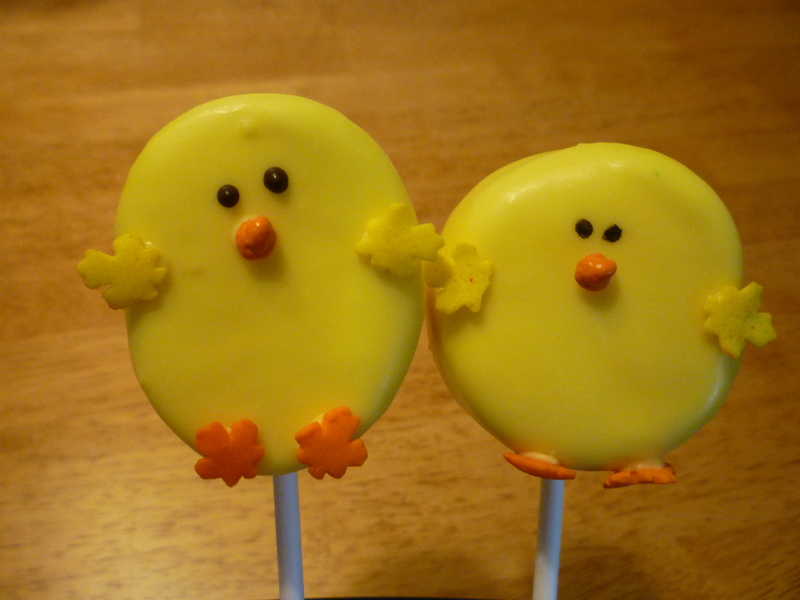 Each little chickie turns out a little different … I hope they make you smile. I love it – genius!!! More please!!! I am so happy that you liked the chickies! Tavette … you are a genius! Thank you for sharing!